The Hollywood Murder Mystery attracted around 70 students to the MUC ballroom to solve a crime on Thursday night. The Campus Activities Board (CAB) brought this sleuthing game to the university to let students participate without having to travel. Sammie Dlugosh, a senior media & journalism major and co-overall for CAB, said that this is one of many activities they’ve planned to bring to campus. “One thing that we wanted to do was bring stuff that you can only do in bigger cities like Sioux Falls,” Dlugosh said. 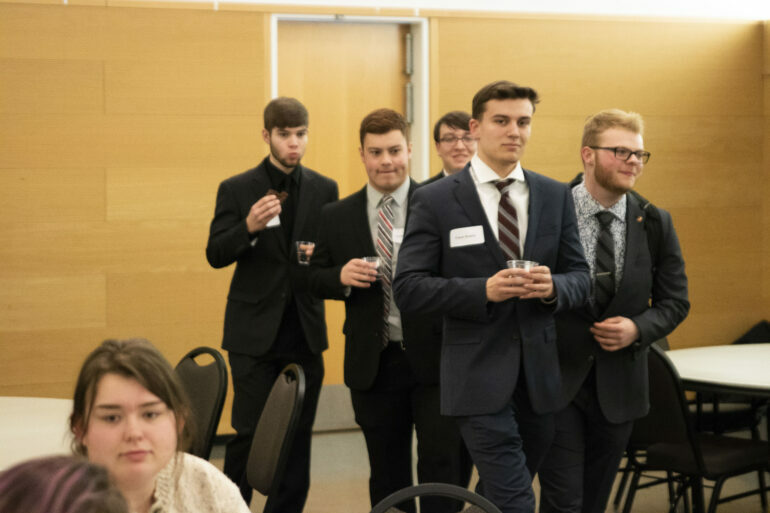 The interactive event had the student suspects quite literally pointing fingers at others across the room, deferring the blame of murdering the Tooth Fairy. Two actors from the group Mission Improbable led the investigation, trying to find the celebrity killer. Throughout the night, participants collected pieces of evidence such as a bloody Oscar trophy, a ransom note, and a coded message. Kaitlyn Housenga, a sophomore chemistry and criminal justice major, said she enjoyed the event, even though she was unsure how it was going to play out. Nearing the end of the event, each table was given a packet with the collected evidence and paper to write who they thought the killer was. They were then given ten minutes to solve the murder mystery. The winning team of the night was “Team Sharon” who had correctly guessed Dwayne “The Rock” Johnson responsible for the crime. The whole group agreed the event was “awesome” and that they would do it again. Sierra Kamin, a sophomore majoring in criminal justice, was one member of the group that put together the clues. “We established that after not preparing himself (The Rock) for the role enough, that The Rock framed Jeff Bridges…by killing the Tooth Fairy,” Kamin said. After the event, CAB member Kelsey Burger, junior health services and administration major, said it turned out well. “We just wanted students to enjoy themselves; that was the main point,” Burger said. “For a Thursday night activity, I think it was really good. Cara Olson, the faculty adviser, said the reason CAB puts on these events is to give the students something cool to do without having to travel any farther than campus.